What a lovely time Kerry and I had in Taupo yesterday with Linda, Glynn and Peggy. My only complaint is that dopey ole me forgot to take any photos. How daft is that? However, I had a great time playing on Linda's Innova machine trying out all sorts of lovely designs.We tried out all sorts of feathers, curved cross hatching, feathered wreath and free motion all over designs. I now believe this machine may have moved from the "want" list to the "need" list. Linda showed me some tips on how to do some fancy stuff on my blog, and other basic stuff that my brain had not figured out yet. So here you are...new fancy picture set and a Bloglovin button. There will be no end to it I'm sure. We swapped some books to read and I have just ordered a new quilting design book...oops. Well a girl needs to keep up date you know. Here's a couple of older photos to make up for not taking photos. I'm off now to read the new book and sit by the fire. Blooming cold here and a -2 frost expected in the morning. Now...where are the hotties?? This quilt was pieced together by my lovely friend Janice. 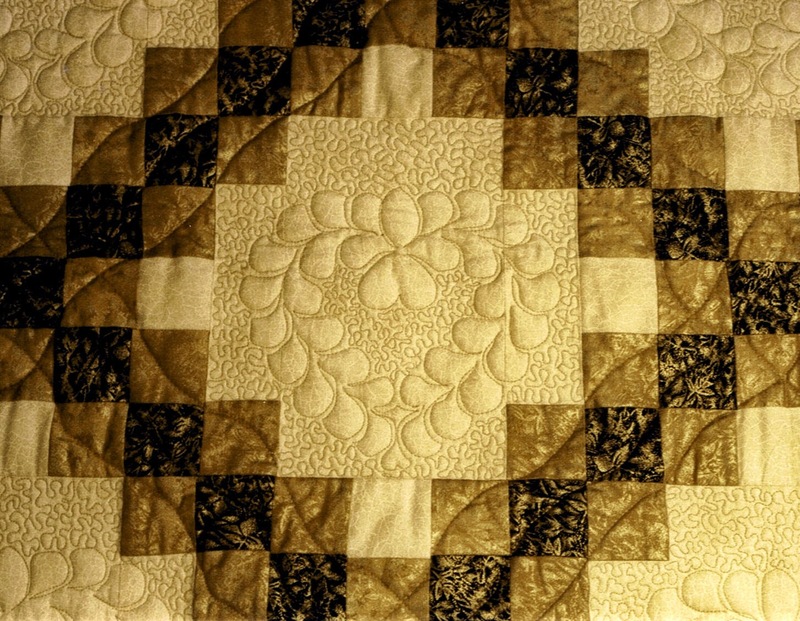 It was the first time I had ever tried feathers, and I was absolutely petrified of making a mess of her quilt. It took me forever to finish as I only had my 16" throat Nolting Hobby Quilter at that stage, that I could only slow down. No stitch regulator or one stitch button. I used a paper pattern, lined and centre it up and then using my laser light quilted each block. I did this really tiny micro stippling to make each heart wreath stand out. It nearly killed my arms at the time. The diagonal lines of course had to be joined many, many times with my little 16" throat. However, I got there in the end and was really proud of the result. I was very thankful to Janice for trusting me with her lovely Irish Chain. Thanks for reading...catch you again later. Who's been a busy pixie then? Love the new header. Wow that quilt is amazing for first time feathers! !